This chapter focuses on the early days before the official war in Iraq. It illustrates the discomfort of waiting for deployment, as the mission is on and off again and finally on. Dark, dusty, and dangerous convoys from Kuwait to Iraq are vividly recalled. Challenges in maintaining a positive mental outlook admidst numerous dangers and challenges such as basic hygiene, urinating and showering in an austere environment, were paramount. 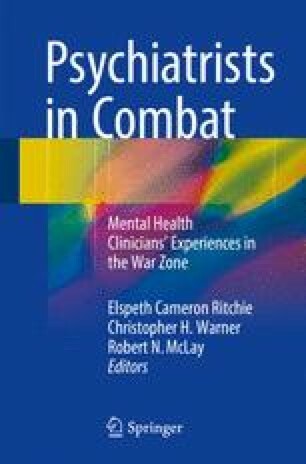 Keeping up morale is part of a military psychiatrist’s informal duties.